The rich analog sound of the world’s most popular multichannel tape machine. For more than 30 years, artists and engineers alike have been drawn to the warm analog sound, solid low-end, and overall presence of the Studer A800 Multichannel Tape Recorder. The sheer number of albums recorded on this legendary 2” analog tape machine — including classics from Metallica, Stevie Wonder, Tom Petty, A Tribe Called Quest, and Jeff Buckley — serve as shining examples of the musicality of analog tape. Fully authenticated by Studer, and modeled by UA’s world-renowned team of DSP engineers and AES magnetic recording expert Jay McKnight over a 12-month period, the Studer A800 Multichannel Tape Recorder plug-in for UAD-2 hardware and Apollo interfaces is the first product of its kind. By faithfully modeling the entire circuit path of the famous A800 machine from Allen Sides' collection at Ocean Way Studios, the Studer A800 plug-in is the most accurate representation of professional multitrack analog tape recording available. 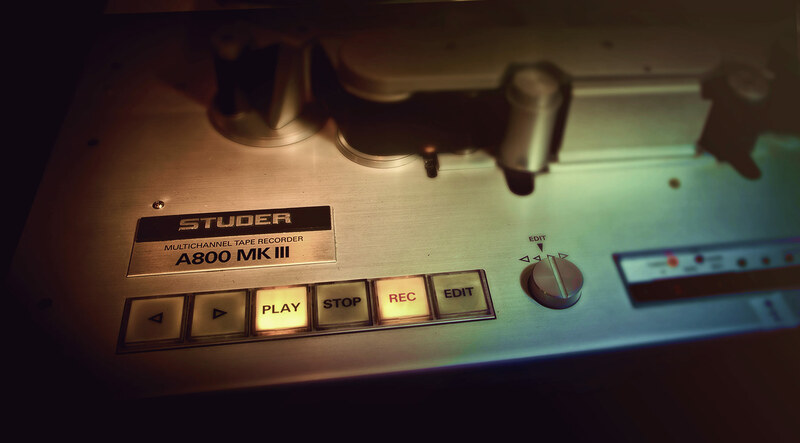 Introduced in 1978, the Studer A800 was the first microprocessor-controlled tape machine. Years ahead of its time, the A800 remains a sonic benchmark, and can still be found in studios worldwide. However, with their massive steel frame and meter bridge, twin half-horsepower motors and cast alloy deck plates, original A800 units tip the scales at a backbreaking 900 pounds. The Studer A800 Multichannel Tape Recorder plug-in poses none of the hardware hassles, yet retains all the beautiful sonics that make tape a beloved recording medium. Just like magnetic tape, you can dial in a clean sound, or just the right amount of harmonic saturation using the Studer A800 plug-in’s Input and Output controls. The reel deck IPS control steps through tape speed choices (7.5, 15, or 30 IPS), each with distinct frequency shift, head bump and distortion characteristics. The tape Type control lets users choose from four of the most popular magnetic tape formulas — each with their own subtle sonic variation. The Cal control allows the user to choose between +3dB, +6dB, +7.5dB, or +9dB calibration levels. Secondary controls are hidden behind the reel deck, and can be exposed by clicking on the Studer badge or the Open label. These controls include an Auto Cal feature, plus separate tape Hiss and Hum, with a global noise bypass. Finally, a Gang Controls feature allows you to simultaneously adjust and sync parameter settings on all Studer A800 plug-in instances in your session. The Studer A800 plug-in's primary recommended use is as the first insert on every track where you want the sound of tape. This way, you can hear the cumulative "cohesive" effect of recording to magnetic tape as you build up your mix. (Of course, it can sound incredible on mix buses as well.) Be sure to strip away all other plug-ins at first — you may find that you end up needing far less compression and EQ, and that your mixes "glue together" more easily. Provides dead-on magnetic tape sound without the hassles of calibration, maintenance, tape degradation, etc.